Der Artikel Hector Berlioz (1803-1869): Symphonie fantastique (K2-Technology) wurde in den Warenkorb gelegt. 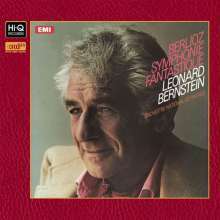 The Symphonie fantastique was Berlioz's first great work and it remains his best known. With its first performance at the Paris Conservatoire on 5th December 1830 he sprang into the forefront of Romantic music, recognizable at once as a composer of powerful imagination whose ideas were new and intense enough to make the era of Beethoven and Napoleon recede rapidly into the past. Like Monteverdi's Orfeo or Stravinsky's Sacre du Printemps it was both novel and masterly; it took a formidable stride forward and is at the same time an enduring work of art, not a mere experiment. Berlioz's inspiration was to cast a succession of passionate personal experiences in the form of a Beethoven symphony. Beethoven had shown how a symphony could be by turns personal, dramatic or descriptive; Berlioz made his first symphony all three, with a 'programme' describing the succession of fantasies which give the work its title. It has a subtitle also, 'Episode in the Life of an Artist', for it is autobiography under the thinnest of veils. Few composers have poured their own lives so generously into their music as Berlioz, and in addition he recounted in his Memoires the ardent life he led as a young and struggling composer; Berlioz's personality comes as vividly to life in his music as in his prose, which should be essential reading for all those who are drawn to the world of the Symphonie fantastique.